The 2018 World Cup is well underway and there have already been some surprising results. There was Iceland’s 1-1 draw with Argentina, for one. Mexico’s victory over defending champions Germany, for another. Oh, and there’s also a new football mode in World of Tanks. Yep, World of Tanks – the in-depth, strategic, tank-combat game – now has a football mode. Instead of battling it out with your team to destroy an opposing squad of tanks on the battlefield, you’ll be working to destroy them with your silky skills on the pitch instead. 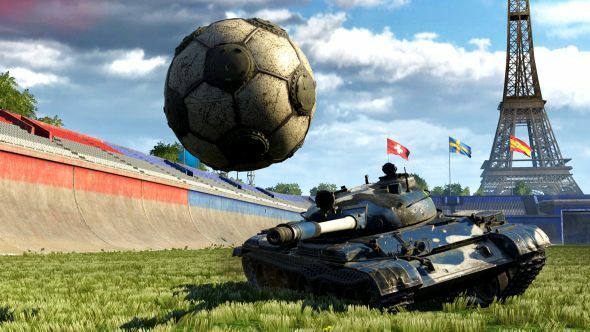 Wargaming has added a new 3v3 mode to the game to celebrate the World Cup. They might not all have football modes, but here’s a list of the best tank games on PC. This is very much not Rocket League, for the record, despite the apparent similarity. For one thing, you can’t boost up a wall, do a barrel roll, and bury the ball in the back of your opponent’s net. I can’t do that in Rocket League anyway, so maybe it’s not a fair assessment. Either way, this is probably closer in feel to Overwatch’s Lucioball than Psyonix’s rocket-powered football game, thanks to your ability to shoot the ball with your tanks. Tank Football, as the game has been dubbed, actually debuted back in 2016 for a limited time, but this is the first time the mode is returning since then. You won’t have access to all of your tanks – instead, you’ll be able to play with a selection of unique tanks. You’ll also have the dulcet tones of legendary Italian goalkeeper Gianluigi Buffon acting as the announcer for the new game mode. If you’re really good, Wargaming says that you can earn prizes hand-signed by Buffon by winning in-game tournaments. Tank Football 2018 will run until July 29.